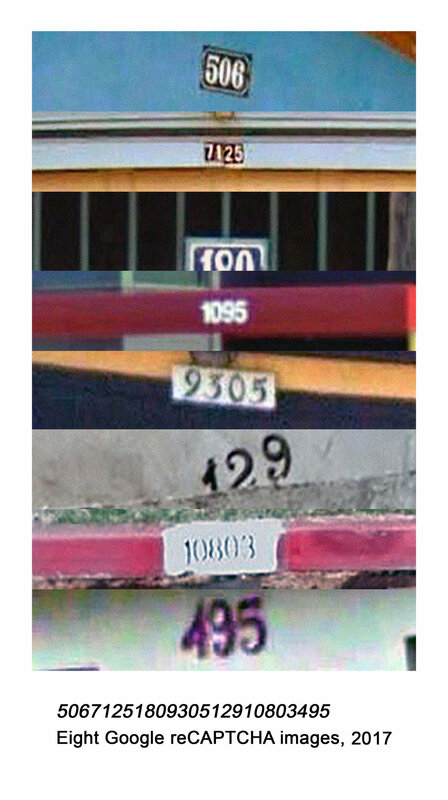 The “reCAPTCHA” system was developed by computer security researchers to prevent bots from exploiting services provided by websites and social media platforms. 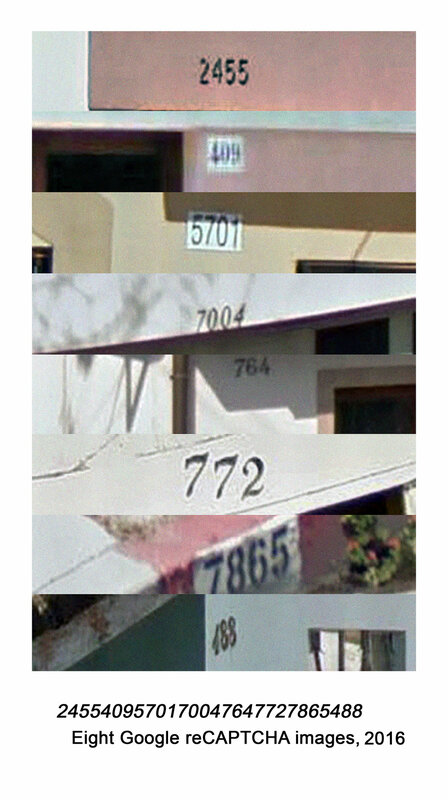 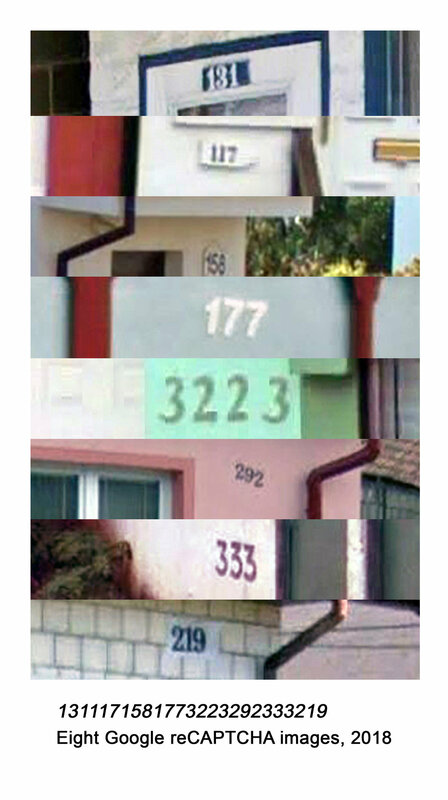 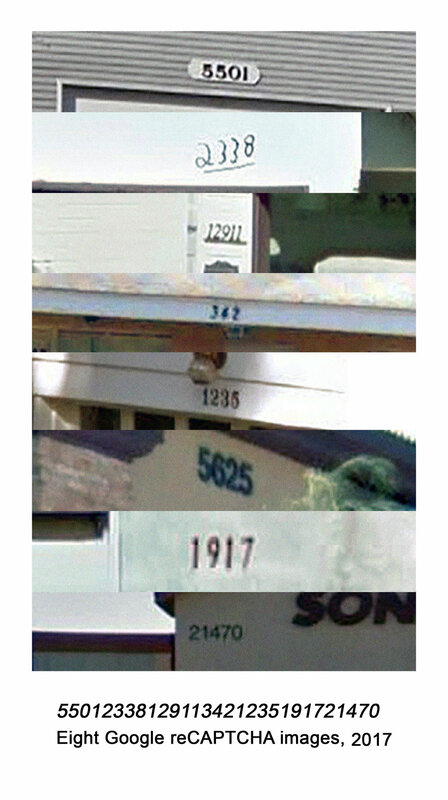 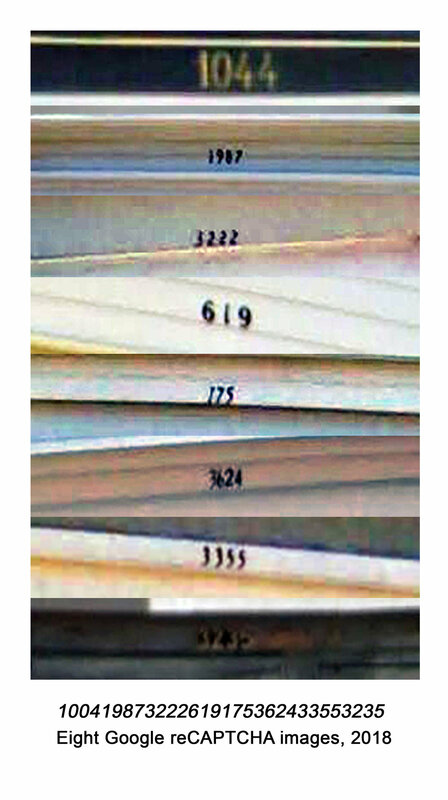 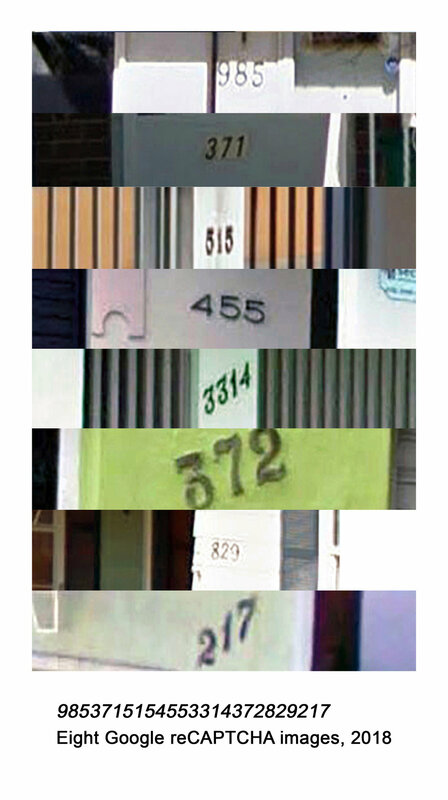 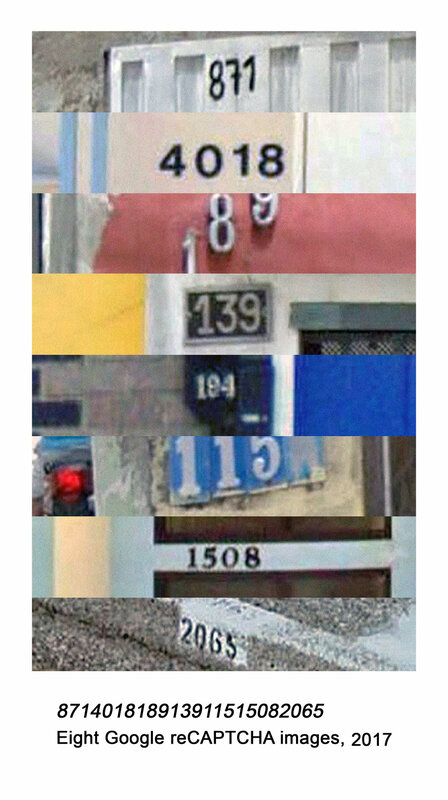 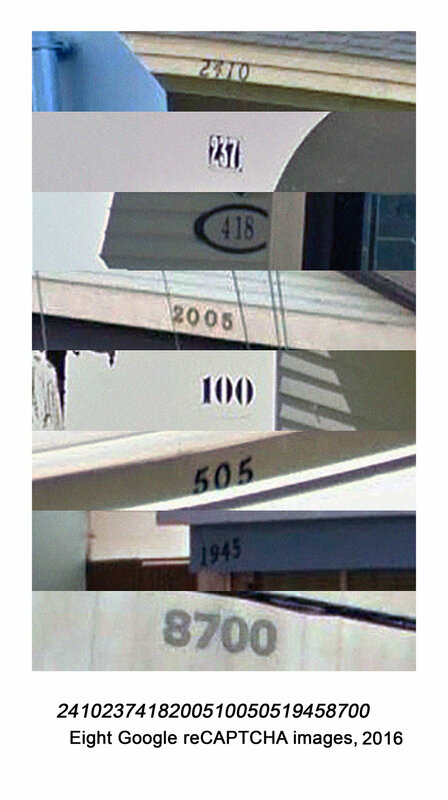 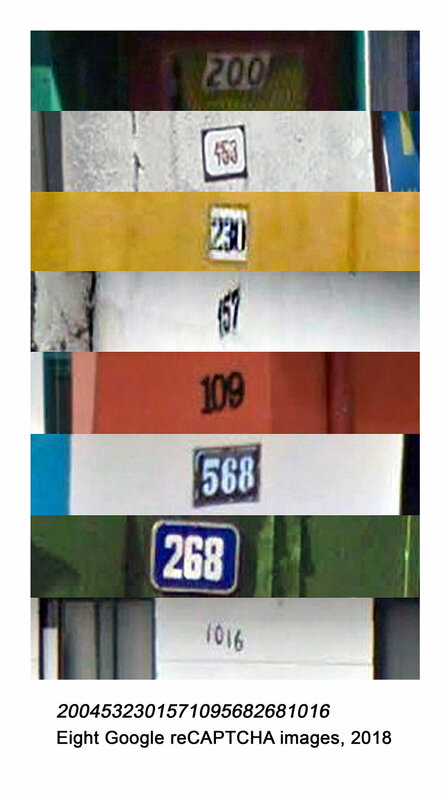 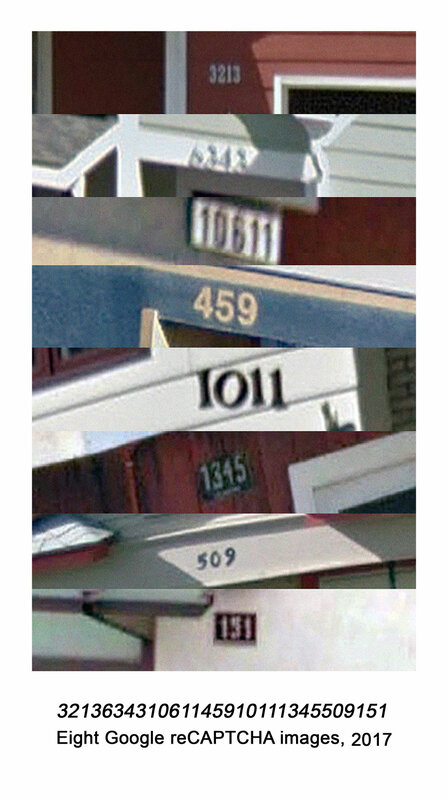 One usually encountered these tightly cropped, lo-res JPEGs, which were sourced from Google Street View, during the process of creating an online profile. 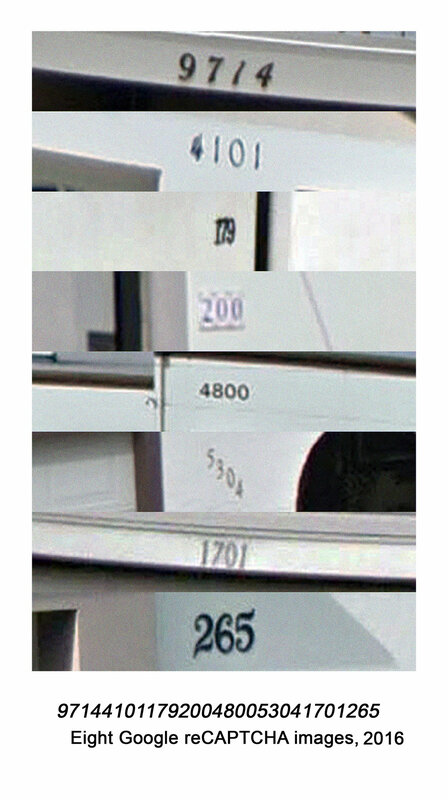 Between May and July of 2016, just prior to an update of the reCAPTCHA system, I had manually downloaded over 2000 reCAPTCHA image files before they all but vanished from the Internet. 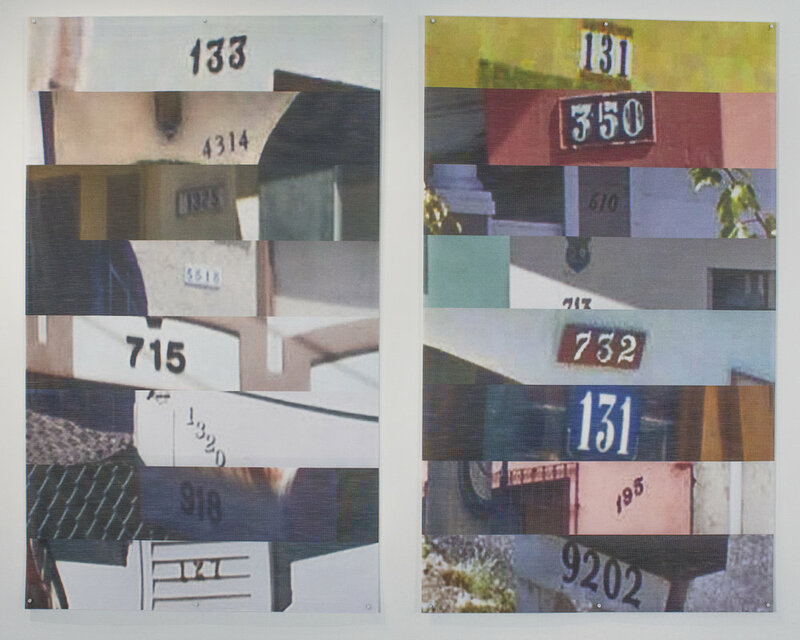 These ostensibly mundane images performed dual purposes. 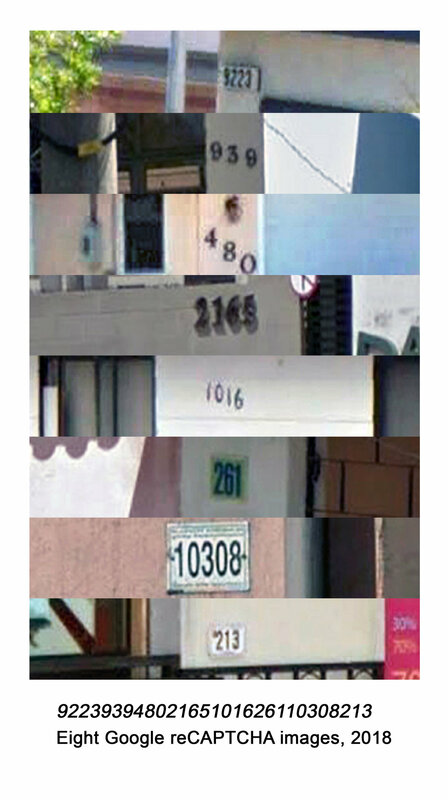 They functioned concurrently as test challenge pictures in an automated gatekeeping system designed to prevent bots from simulating human agents -- “Prove you’re not a robot” – while also serving as dataset images to develop AI. 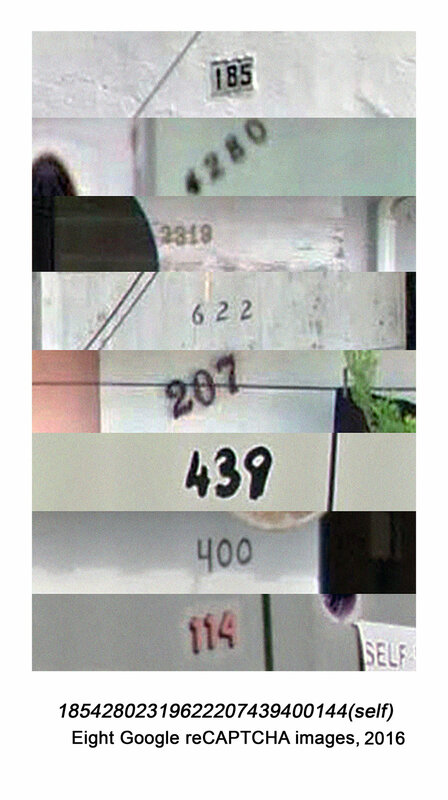 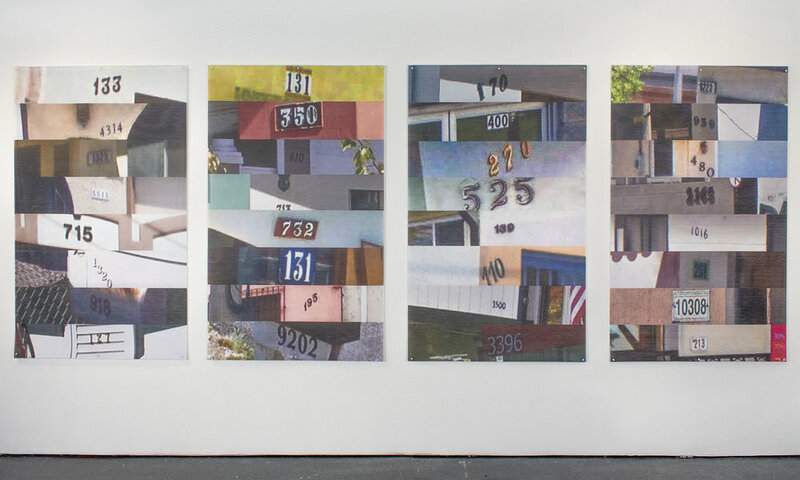 The reCAPTCHA image files became the constituent elements for an ongoing series of collages and other works of art. 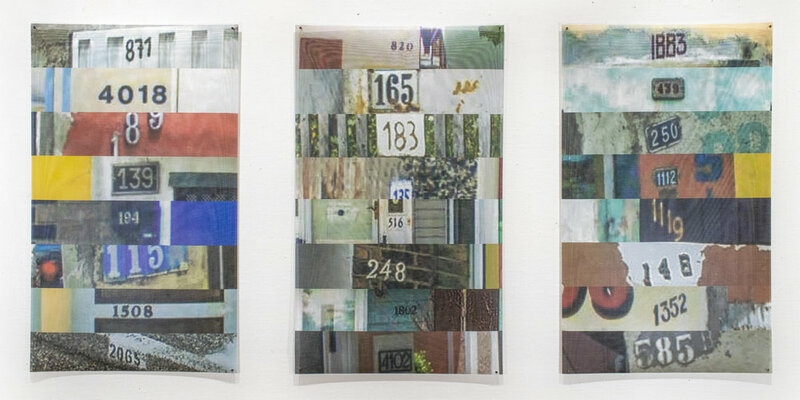 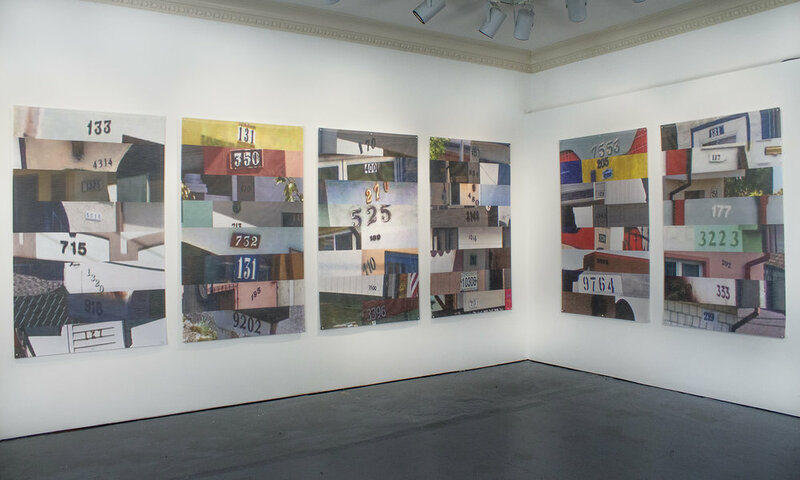 * I print the collages on vinyl mesh, which is typically used to obscure construction sites, because the perforated surface of the material evokes the shimmer of a computer screen. 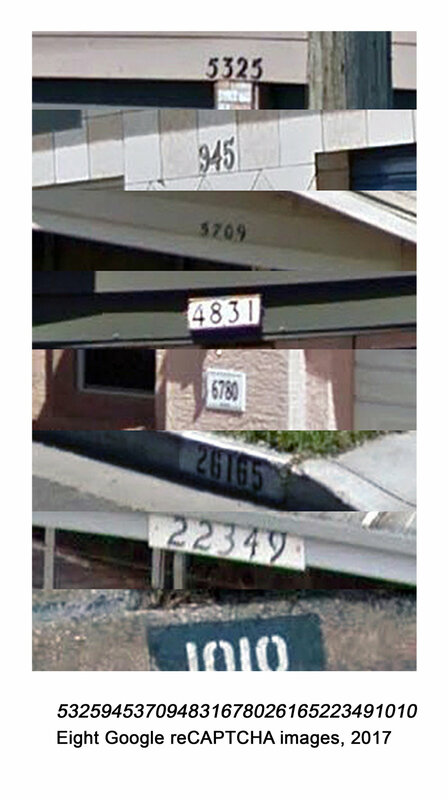 Although features from the domain of humans occasionally infiltrate the narrow frames of the reCAPTCHA images – flowerpots, basketball hoops, flags, and other things that robots would have little use for – I was initially drawn to the generic sense of “placelessness” that imbued them. 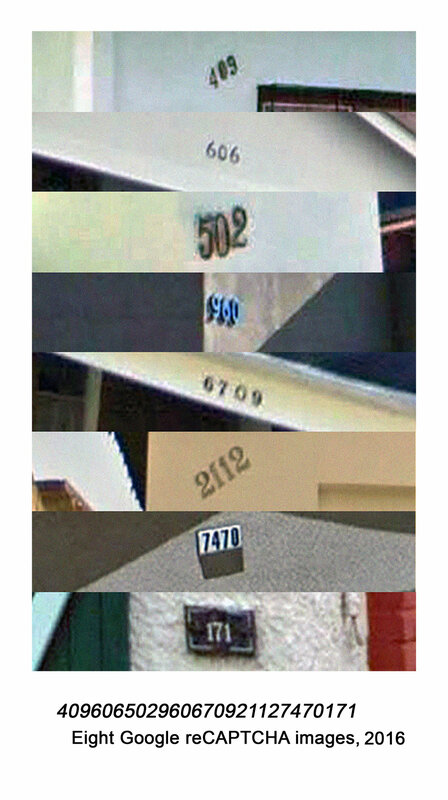 Yet, beyond these incidental encroachments, I was also intrigued by the tensions that reCAPTCHA images harbored; they both affirmed and normalized corporate mass surveillance as the status quo. 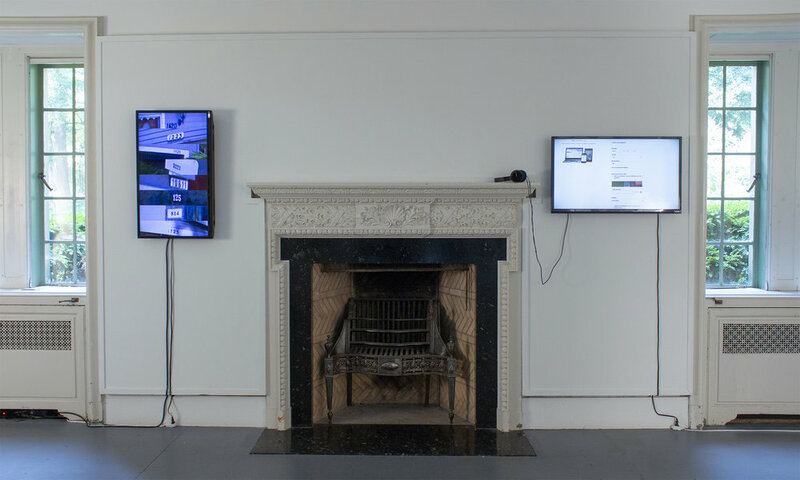 Further, while they function as conventional digital photographs, although ones that were taken impersonally and that would be considered poor quality, they also act as conduits for data collection. 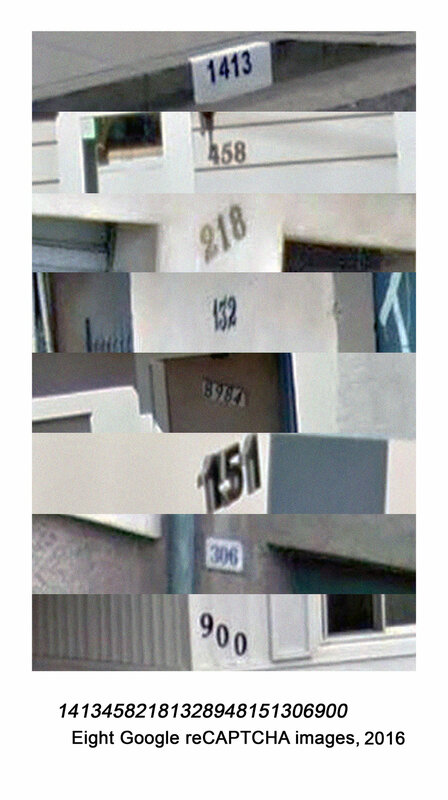 In these contexts, where the reCAPTCHA images interface with society, culture, and digital labor, they acquire an artifact-like quality making the file folder where they are stored akin to a digital excavation site.